Sharon Jones & The Dap-Kings - Soul Time! 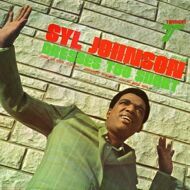 Released in the summer of 1969, Syl Johnson’s first full length outing compiles the fruits of his late ‘60s Twinight sides. Included are the seminal, and often sampled, hits “Come On Sock It To Me” and “Different Strokes.” Issued on 150-gram vinyl and housed in a tip-on jacket, Dresses Too Short is the perfect entry point for any exploration of this soul titan’s most fruitful years.